As supply chains crank back into action following the vacation, the January ocean freight GRI (General Rate Increase) stuck, with China-US rates increasing by 27%. While prices may continue to climb slightly until the Chinese New Year, expect them to drop back after February 16. “The effective GRI on FCL in January has been about $300 for China-US West Coast, and $500 for China-East Coast, but we believe the lift from this and two more GRIs coming up won’t last. 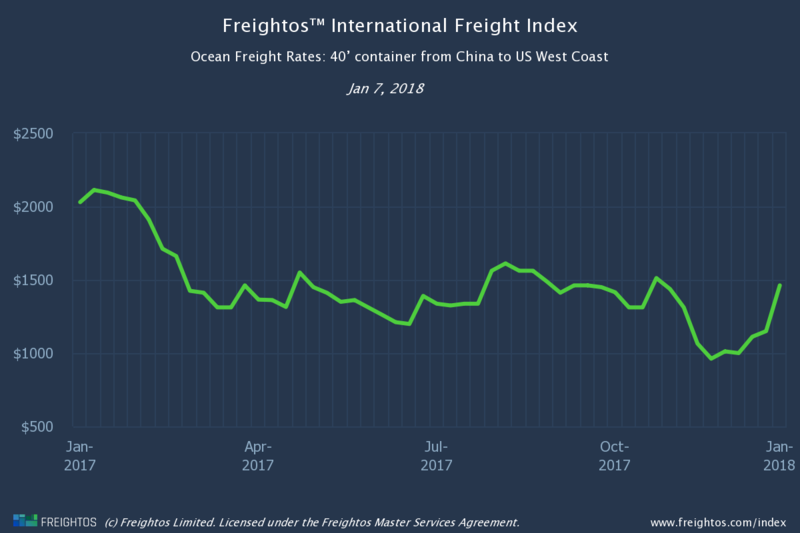 It seems oversupply will keep ocean freight prices low for the foreseeable future, as evidenced by a lackluster peak season. The situation is better for air freight. Increased demand, particularly from increased cross-border e-commerce, is applying an upward pressure on prices. Recent snowstorms on the US eastern seaboard and severe storms in Europe have taken a toll. Expect cargo backlogs to return, with rates only dipping a little until mid-January, when the Chinese New Year runup begins. The January 1 GRI is riding the back-to-work increase in shipments, with an average GRI effect of $300 for China-US West Coast and $500 for China-US East Coast pushing prices up by 27% this week. Space isn’t tight as of yet. However, the GRI has been less effective so far than last year, and prices still lag last year’s rates (30% down for West Coast, 23% down for East Coast). Same goes for China-Europe’s early January price spikes for both years. Although prices jumped a little this week, the year on year comparison deteriorated. Space will tighten closer to CNY, so expect prices to go up again. Europe-US East Coast rates jumped 26% and are now the closest they’ve been since October to last year’s prices.